Two lovers, two hearts, one soul. Only joined can they be truly complete. Only joined can they survive the darkness. The Fey King Rain and his truemate Ellysetta share a passionate love unrivaled in the history of their world—and a forbidden power that made them outcasts from the Fading Lands. As war looms and the evil mages of Eld threaten to rip their world asunder, they must fight to defend the very kingdom and people who reviled them. Only by trusting completely in their love—and in themselves—can Rain and Ellysetta hope to defeat the gathering forces of Darkness. But it will take more than the strength of their devotion to endure. They must unlock the secrets of the past and find the courage to embrace the dangerous destiny that awaits them. Only they can save their world, but that victory might cost them their lives. 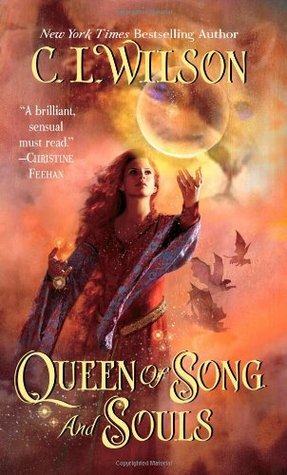 QUEEN OF SONG AND SOULS by C.L. Wilson left me breathless. Some books rob me of words to adequately describe them. This whole series set in a complex magical world merits that description. If you've been following my reviews of this series, you already know that I love it to distraction. I discovered this author when I happened to read her THE WINTER KING, which was another awesome read. I am so glad I found it and her! As I was waiting on the sequel to THE WINTER KING, I found that she'd also written The Tairen Soul series. It's quickly become my obsession. Thankfully, all the books are available so there's no excuse for waiting to dive in. This is a series that you absolutely must read in order. The hero and heroine are the same for all five books in the series. The series is complicated in a phenomenal way and relationships with the colorful array of characters have been developing with each book. You would be hopelessly lost without that background. Each story picks up where the former book left off. Do yourself a huge favor and read it in order. You won't be sorry. "Shei'tani... wilt thou swim with thy beloved in a river of dreams?" "What in the Haven's name just happened?" Dazed and still trembling from the overload to her senses, Ellysetta floated in Rain's arms, her limp body draped across his, incapable of autonomous movement. She could barely think straight, let alone summon the strength to actually move. Rain's chest rippled as he dragged in a shuddering breath. "I don't know." His voice came out hoarse, raspy. He swallowed, then tilted his chin against his chest to glance at her. A grin twitched at the corners of his mouth. "But I hope it happens again." "Mama always used to say it's better to choke on a bitter truth than savor a honeycake lie." Every Fey warrior and shei'dalin born in the Fading Lands learns very early in life that, like it or not - fair or not - there will be many days when they must decide between a bad choice and a worse one. Today is such a day." C.L. Wilson's writing blows me away with the depth and scope of her writing. This series is truly a masterpiece encompassing five books. She has artfully blended romance and fantasy into a pièce de résistance. I highly recommend this series to anyone who enjoys epic romantic fantasies. Just be sure to have the final book nearby when you finish this one as you're going to want to continue the story forthwith to its wondrous conclusion. This is such a wonderful series!!! I love everything about it. Wilson has a beautiful writing style and I can't get enough of it.